Global investment company, QIC, is a financial institution where numbers and data are key. Showing results and the effectiveness of projects across the organisation are easily presented in a quantitative way for most departments. But for the marketing and communication team, whose campaigns are naturally harder to measure and evaluate, there was a business need to find a solution that allowed their efforts to be on par with how other departments report their findings. There was an underlying need for measuring and evaluating communication at QIC. The team was driven to clearly show what their marketing strategies were doing and the benefit they were delivering. They wanted to collate their results into an easy-to-read, data-driven report that could be shared with the internal clients and the Corporate Management Group so they could see their funds were being spent in an effective way. QIC chose The Communication Dividend for a number of crucial reasons. Firstly, TCD is an all-inclusive “one stop shop” measuring and evaluating tool that includes an extensive range of metrics. They could easily choose the metrics that related to their organisation and campaigns. They also wanted a fit-for-purpose product that matched their system requirements. It couldn’t be clunky or a product that required the team to learn how to code, or spend hours in training. QIC is experiencing benefits and improvements from the data insights and measurement. Our key stakeholders are interested in how measurements are tracking and there is richer conversations about what worked and what didn’t. We have been able to drive change by demonstrating low client engagement and interest and therefore deliver better outcomes to our clients. The Communication Dividend is a valuable measurement tool. If you’re looking for a solution to bridge the gap between business strategy and communication strategy, contact us today. If money makes the world go around, then financial communication is about sharing the money story. Yet, knowing what to measure to prove your value can be a challenge. Find out more about the metrics that matter in telling your company’s corporate performance story. 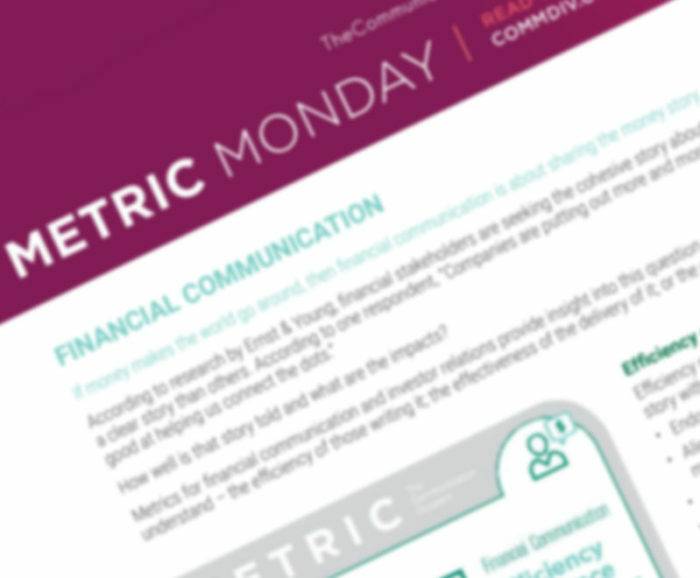 Download our Financial Communication Metrics here. Please fill in the form below and you can download our Financial Metrics pdf.